Came across a jdm po8 ecu and after opening it I found a capacitor leaking and two other electrode thingies that looked like they got cooked extra crispy. Can someone tell me what these crispy things are and what they are called and if they can simply replaced and where to find some new ones? I'd just like to save this po8 if I can, it's a manual one and kinda rare and is also for sale if someone needs it. It's hard to describe these things but there side by side wirey looking things that looked like they got burnt black taking up the r62 and r63 positions of the board, I will post a pic. If anyone can help me identify these things and where I could get them I'd appreciate it. replacing the electrolytic caps on our ECUs is a must, they are simply getting old enough to have issues often. The r designator means resistor. sorry, any more info I'm going to have trouble with right now, work blocks the picture. Cool so r means resistor. Any idea why those resistors got nice and fried like burnt toast? Any idea where to find exact or equivalant resistors? Anyone maybe have a parts board and want to sell those resistors cheap maybe? these two resistors are in the IACV control power circuit. Normally each resistance has a value of 1 ohm. Thanks for the reply dip but I'm new to resistors and am trying to take a crash course on them. So if the resistance is 1 ohm does that mean this is an easy fix and all I'd have to do is get sone 1ohm resistors and solder them in and she's all good. Is it that basic and easy? And forsure they are 1 ohm right? Where can I order and find resistors I've never shopped for them before and how much should I expect to pay? 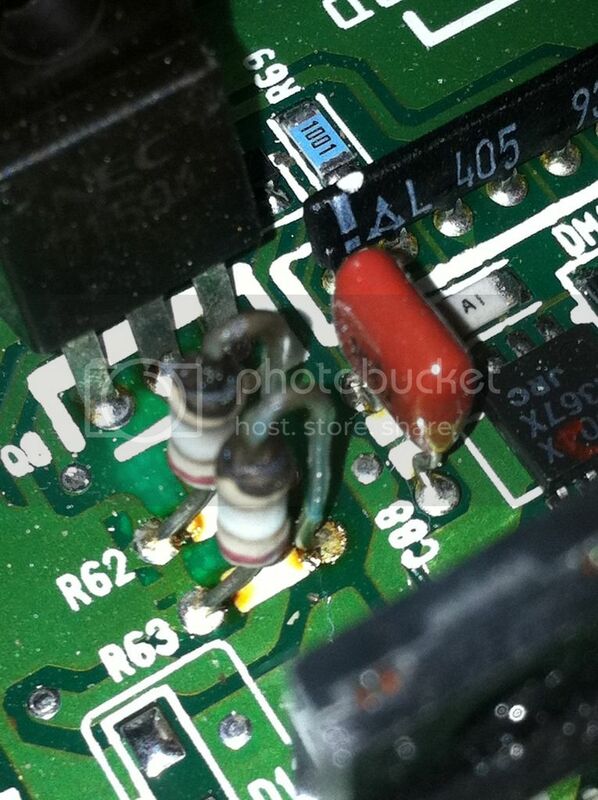 Also any idea why those iacv resistors would cook? I've opened up a few ecu's before and have never seen that before and think it's a little strange that that has happened, is this a common issue? I now know these are 1 ohm 2% resistors. Learning more about resistors I know now alot but what I don't know is the wattage of these resistors. During my quest to find these resistors I only found one company that manufactures them KOA speer which I emailed directly to buy 5 from them but they're probably going to tell me buzz off sincd they're a huge company. So then I came across mouser.com that has them but they are asking me for all types of addition information like if they're carbon film, metal film, thick film, planar and they're also asking the termination style: axial, radial, flange, lug, screw, so can anyone tell me more about these resistors I'd like to order the right ones. Should it be necessary, you could just send them a picture via e-mail or one of these resistors in an envelope..
For the axial/radial/whatever you could've just googled it, for Christ's sake. How hard is this? What you need is an axial one, just take a look at the other ones on Google..
By the way you can also find the color codes for the resistor values on Google. Addition: In the German Wikipedia they say carbon film resistors are less precise than metal film resistors. They say the latter were also acting as some kind of "safety resistor" as they have a positive temperature coefficient and automatically reduce the current if they get hot (metal resistance increases with temperature). For carbon, which conducts even better the hotter it gets, this property is reverse - so their resistance decreases and they allow even more current to flow as soon as they get too much and start getting hot --> I imagine also other components might be damaged more likely in that case. Yes I did Google axial and radial and I did learn about the stripped color codes and that the last stripe represents the tolerance. But thanks blues for letting me know though that I needed axial resistors because I honestly and truthfully did think I needed radial ones because those ones jump out but now that you've mentioned they're axial I can see now that they're the same as the others just put in differently and I'm actually curious why they did that. So thanks for that because Mouser didn't have 1 ohm 2% radial resistors and was wondering if axial ones would do instead. The ones I think I'll go with are KOA Speer mf1/2lct52r1r0g from Mouser.com. Those ones are 0.5 watts can anyone tell me if that's what I'm after? Also I'd like to know if I'm over or under by half a watt or so would that cause any problems? I'll probably just get 1/8, 1/2 and 1 watt resistors since they are so cheap and then compare. I am a rookie so I'm trying my best to figure this stuff out, these resistors seem pretty complex for something so small. Also like to know if anyone else thinks those resistors fried because someone plugged there iac harness into a different plug, I've read people have gotten problems from doing that so my best guess is thats what happened. But thanks blues and thanks dips for the intel would've been a little stumped without it. can you tell us whats actual problem/error that you have? got CEL? Check the IAC valve and the 2SD1594 transistor. I am sorry gee but I just came across this ecu and was hoping to fix it up and sell it to someone that needs one of these to be 100% honest with you. I wish I could let you know so I could help you I found your other post where you have the same type of problems with a p08. I don't know how much this is worth in this condition but do you want to make an offer on it? I'm just trying to have fun learning about these things and how the pro's fix them. My best guess why they cooked is that someone plugged in the wrong plug to the iac circuit but that is just my best guess. And dip I am going to see if I can see that transistor you mentioned, and just to let you know that link didn't work for some reason.